From Instagram, Facebook to Urbanspoon reviews, Architects and Heroes have been gaining popularity for their food, coffee and cakes. Since it’s opening a few months back, this local cafe in Subiaco is currently the talk of the town. 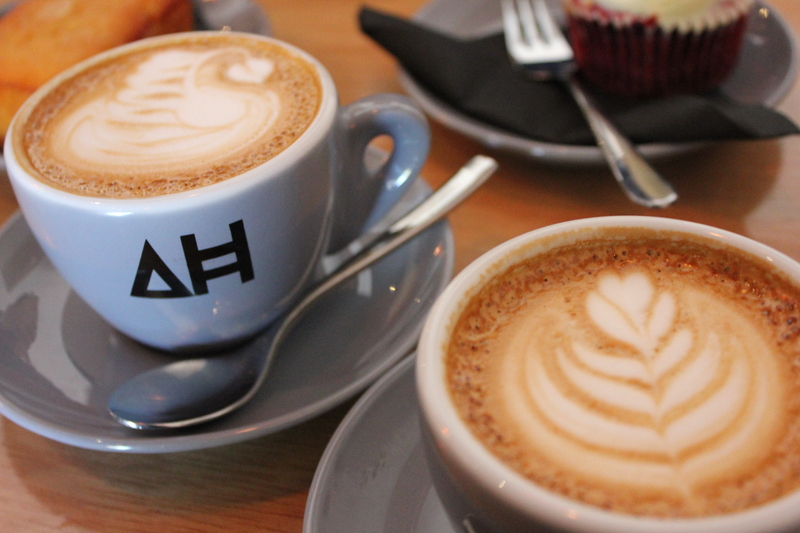 If you are a coffee aficionado, I highly recommend you to check out Architects and Heroes. We arrived early at Architects and Heroes for brunch (I do hear that it can be quite crowded as the cafe is compact). We were given a seasonal menu and an all day menu to choose from. It’s really great to see cafes doing seasonal menus to give customers something different. For brunch, mum had the Seafood chowder with fresh local produce: mussels, prawns, scallops, fish and squid with a side serve of crusty bread ($17). The seafood chowder was generous in serving and was smooth and creamy. 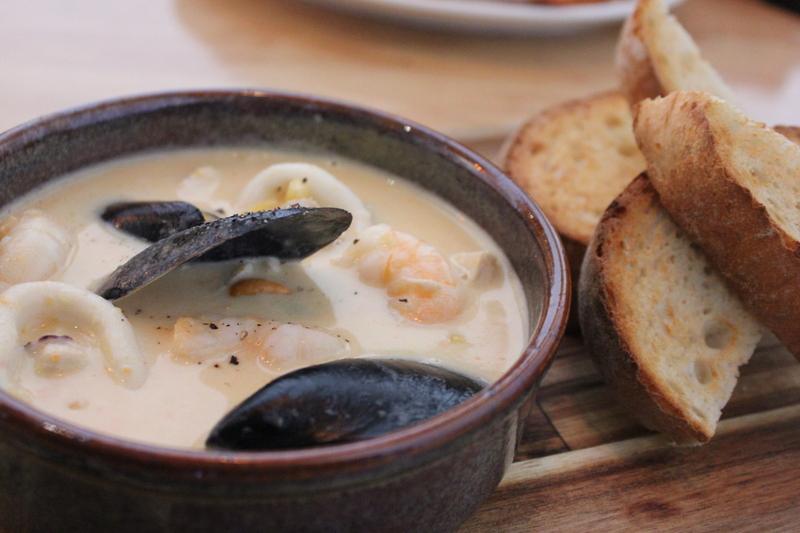 The mussels, prawns, scallops, fish and squid swimming in the chowder were fresh and full of flavour. A perfect dish to keep warm for a cold, rainy winter’s day. I had the Eggs on toast which consists 2 slices of toast with the 63 degrees egg ($10) with Elmar’s Continental Bacon and Kransky Sausage as an add on for $4 each. The 63 degrees egg was spot on with an explosion of oozing yellow liquid once I sliced it through. Look at how beautiful that egg yolk is! The bacon was crisp and the Kransky sausage was delicious. 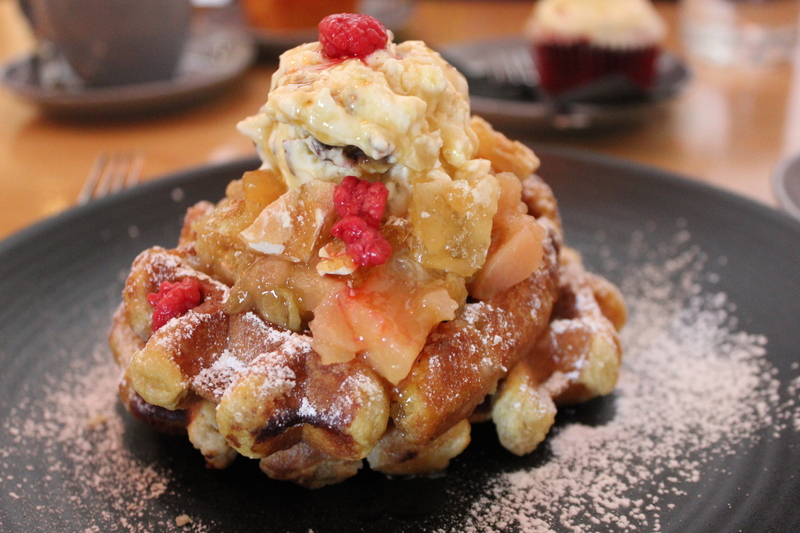 We also shared the Belgium waffles with apple, raspberry and rhubarb compote with macadamia parfait ($16). It was a lovely dish. The waffles were soft and fluffy. Together with the apple, raspberry and rhubarb compote, it gave the waffles soft and sweet flavours, topped with macadamia parfait like icing on a cake. Overall, I thought that Architects and Heroes was cool, hip and trendy together with warm and friendly service. A great place to catch up with friends over food and coffee. Oh and if you are at Architects and Heroes, don’t forget to check out their cakes on offer too! 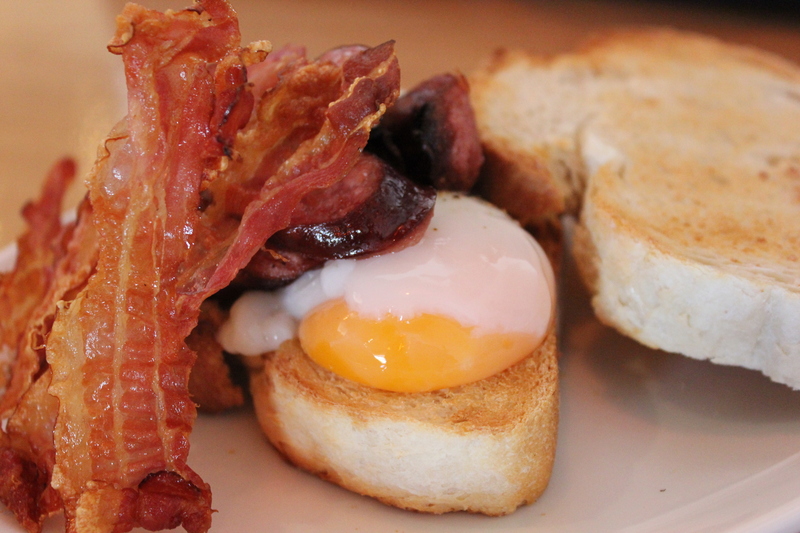 I love their coffee, and your eggs and bacon looks so good!